Next VizThinkU Workshop: “Agile Presenting” – July 30th! 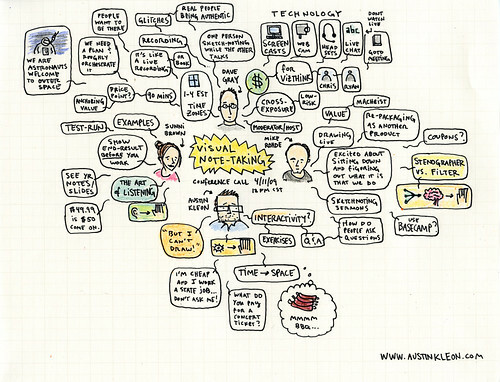 A quick VizThink update: Next Thursday, July 30th, we’re having our next VizThinkU workshop: “Agile Presenting: Engage your audience and introduce interactivity to your presentations” with Heather Gold and John Vlismas. Both are successful comedians who have also made a name for themselves as speakers with their respective, widely-praised, sessions “Unpresenting” and “The Shared World”. More than you might suspect. Imagine the work environment of a stand-up comic: Performing in an unfamiliar environment, to an unfamiliar crowd and they know there are at least one or two people out there in that dimly-lit room who probably want to take them down a peg. Sound familiar? Maybe reminds you a little of your last speaking engagement, sales presentation or meeting? While we’ve focused a lot at VizThink on making your presentations look more appealing and be more effective from a visual stand-point, we haven’t spent a whole lot of time on the skills around delivering it – which is why we assembled this VizThinkU course. This workshop will introduce you to new ideas about engaging and interacting with your audience as well as approaches to think quickly on your feet and react to unexpected situations. Our two faculty members for this session, Heather Gold and John Vlismas, are both accomplished comedians and public speakers. In addition to their stand-up careers they’ve also consolidated their skills and experiences into workshops that they’ve delivered around the world, and our now bringing them online as part of VizThinkU. This session promises to be entertaining and informative and you don’t want to miss it – be sure to register today. People who work in the digital realm love interactivity in every realm, but when it comes to presenting, they forget all about it. In this workshop on UnPresenting innovative comedian Heather Gold breaks down how public communication works and then remakes it in our collective image. Heather focuses on the main thing business has ignored: the actual source of power in the room and how to engage it. Successful comedians are high-functioning multi-taskers. They must exert charm, pre-empt mood changes and conclude a sale every time they tell a joke. Essentially, they are expert at forming temporary movements and guiding that movement for the duration of the performance. Take away the humour, and the skill set resembles the ideal profile for a good leader, be it a person or a brand. Where corporations find it difficult to react to their markets quickly, encumbered by protocol largely designed to assign blame, comedians must assess and react in the blink of an eye, sometimes facing several thousand people they have never met. Ideally specialist communicators, comedians are adept at managing risk, and do so constantly. The Shared World™ is a system of thinking which encourages high-speed analysis using empathy, intuition and assimilation of data rapidly to make lightning speed, high quality decisions. The key to winning over an audience is to position oneself directly at the heart of the crowd. Instead of trying to analyze how they feel – experience how they feel. Honestly, I’m really pumped for this workshop – John & Heather are both hilarious but, at the same time, also have really great content. Whether you have to make small internal presentations or speak regularly to large audiences I guarantee you this is one you do not want to miss. Check out the workshop page at vizthink.com and register today! A couple of weeks ago we had our inaugural VizThinkU course, Visual Note-taking 101, which from all accounts was a rousing success – so today I’m very pleased to announce the next VizThinkU course “Drawing out your ideas: Techniques for visual thinking, note-taking and presentations“ with Nancy Margulies, a master visual facilitator. The workshop will take place online on June 16th, 2009 at 2pm EST (GMT 18:00) and will last approximately 3 hours. Additional details about this session are below. Watch as Nancy Margulies, a master visual facilitator, demonstrates the process of using words and images to convey ideas during this three hour online workshop. Using example projects from participants, Nancy will create visual images that conveys all the ideas and relationships among them while teaching you tools and techniques that can be taken back to apply to your own work. Nancy has taught thousands of people to develop skills that enable them to record their ideas using images as well as short phrases. This skill will enable you to “think on paper” to gain a deeper understanding of complex systems. With the skills Nancy will teach, you can map a given activity and then look at the consequences, unintended consequences, resources needed, and other factors so that you have the “big picture” and a truly systemic view. Or you can use visual recording to convey an idea you want to present to others, with images that make your presentation more engaging. Nancy is the author of several books on drawing and visual recording. She can teach you to draw with greater skill and will give you a set of symbols you can use for everyday visual mapping. If you believe you can’t draw, prepare to be delightfully surprised. Planning is another process that is greatly enhanced by visual recording. As a student of Nancy’s you will have access to templates that you can use as the basis of “planning maps” – planning for everything from a meeting, to a large scale event or even planning your future. Sign up early and submit the ideas you would like to see visually mapped by Nancy. First come, first served! This workshop is a logical continuation of the Visual Note-taking 101 session from last week – while it’s not a prerequisite, it will certainly help you maximize your experience with Nancy. Missed it? Not a problem! To help you catch up we’re offering a special discount on Visual Note-taking 101 for the next couple of weeks. Everyone who registers for the workshop before June 9th 2009 will receive a discount code that gives them $50 off the cost of access to the recordings from Visual Note-taking 101. It doesn’t get any easier than that! Next Thursday, May 14th, 2009 a new series of lectures on the topic of Visual Thinking will be starting at the University of Toronto. It looks like a great lineup of speakers, bookended by two past VizThink conference facilitators, Neil Cohn & Colin Ware. At this point I’m planning to be at all of the lectures (and will be declaring them unofficial VizThink Toronto meetups at the same time ;) ). It looks like it should be a really interesting format – the talks start at 5:15 and go until 6:45pm but each talk will also be followed by a public “brainstorming session” that runs until 8:00pm – I have no idea what that entails but it sounds like fun. If you’re planning to attend any of them drop me an email (ryan@ this domain) or ping me on twitter @ryancoleman & we can all plan to go for a drink after to continue the conversation (and see if we can’t convince the speakers I know to join us ;) ). I’ve also created the event at the vizthink site so RSVP if you’re coming.